Talking to someone whose baby has died is hard. It can leave you feeling lost for words. How can you possibly say the right thing when someone is experiencing unfathomable depths of pain and loss? Sadly, this feeling means many will choose to keep their distance – to “give the grieving parents space” – rather than confront their agony, and have what could be a difficult conversation. But that difficult conversation could mean so much to someone whose world has just caved in. We were in awe of one MOLO, Maire Fogarty, who posted in The Motherload® Facebook community during the week of the third anniversary of her daughter’s birth. 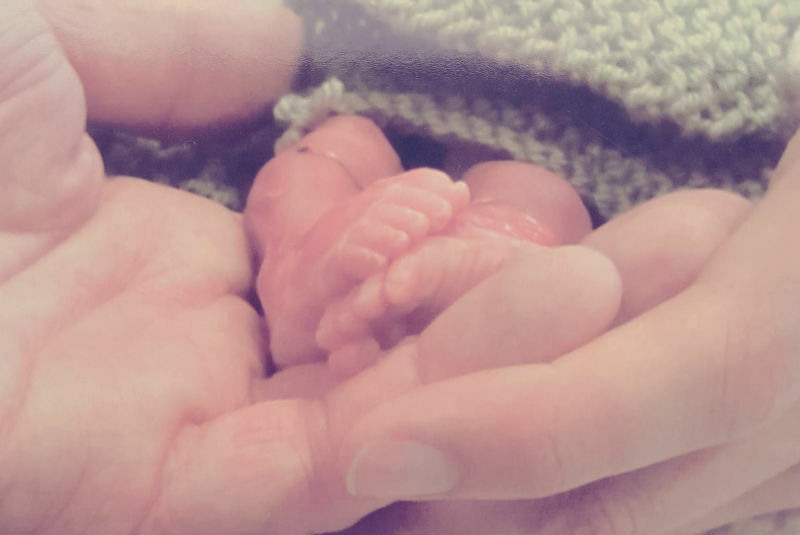 Maire explained that her daughter Grace was stillborn, and she shared a photograph of her beautiful baby’s feet. She also wrote down this incredible advice for people who know someone whose baby has died. She got an amazing response from thousands of other mums, many of whom have suffered the tragedy of baby loss. We asked Maire if we could share this valuable insight here, and she agreed. She’s also added some extra points. Hopefully it will help more people know what to say when they feel lost for words, and help them support their friends and loved ones when they need it most. My first little girl would be three next week but sadly she was stillborn. To say the loss of my first child broke me is a massive understatement. There were days I thought I’d never stop crying, never breathe properly again. But I’m still here thanks to great friends and family and the fact that myself and himself have welcomed another little girl since then and that little wagon keeps us smiling. Since the loss of our little girl, Grace, there have been times when I’ve had to bite my tongue and not respond to some of the absolutely ridiculous comments people have said. So this week, as a way to honour my little girl and in a small show of support to bereaved parents I’d like to offer some advice to anyone wanting to know what to say or do for someone whose baby is stillborn. Here is a picture of the tiny feet that silently entered the world. It’s the first time I’ve shared my Grace on Facebook. * Ask what their baby’s name is. Say the name. Hearing their baby’s name will never upset a bereaved parent but not hearing it probably will. * Don’t suggest that having another baby will make them feel better! * Ask the father how he is. People rarely do. * Try not to say things like “did you get over everything ok?” They lost a baby. Not a wallet! * Text them. Check in to see if they’re okay. * Never assume that people will return to their normal selves. A friend recently told me she’s surprised I’m still upset! * If the couple are fortunate enough to have another baby, don’t say stuff like “well you wouldn’t have baby b if baby a lived”. * If you’re lucky enough to be pregnant and you have a good friend who has lost a baby, please take the time to send them a private text to tell them your baby has arrived. They’ll be happy for you but they don’t need to be included in a group message listening to the phone beep every two minutes with messages of congratulations. * Be there. Or offer to be. Even to just sit in silence or drink tea. Simple gestures mean the most. * Please don’t try to avoid someone whose baby has died. I understand it’s difficult to know what to say and people are afraid of putting their foot in it but saying something, anything is better than avoiding them. If you don’t know what else to say simply the words I’m sorry” will do. All anyone asks for is acknowledgement. If someone’s child died in any other circumstances, people would flood them with sympathy but for some reason when a child is stillborn the subject is often avoided. * Remember that they had a baby. It was not an unfortunate event. They had a baby, no different to yours or anybody’s else’s. They felt their baby move, saw it on a scan. They probably had names chosen, bought baby clothes and a crib. Their body went through the same labour pains but they did not hear a cry in the end. My little girl was perfect. Tiny, but perfect. She had ten fingers and ten toes, hair, finger nails, no different to any other baby. My body responded to child birth in the same way as the other mothers who took their babies home. But I never got to experience the joy that they did. I never saw her eyes, never saw her smile. * Although some people may have some religious beliefs, it’s not always welcomed when people say things like “You have an angel on your shoulder now”. “God needed her more than you”. “She’ll be in heaven with the angels”. I know people mean well, they don’t mean to upset anyone but hearing comments like that were of absolutely no consolation to me. I don’t want an angel in heaven. I’d much rather have a little devil causing mayhem here! * Encouraging people to move on and not speak about their baby afterwards can cause a lot of resentment, anger and sadness. I remember telling colleagues when I was pregnant again. One of them told me to look to the future, don’t talk or think about “That” again. And then one of the most infuriating comments I’ve heard…. “Onward and upward now”. Like I just got a bonus payment! * If the parents have one other child, please try not to refer to that child as an only child. My second girl is not and never will be an only child. She has a sister. I will always have two girls. If people can’t accept that or think it’s odd I actually don’t care. My little girl waves to her sister in the stars every night and says goodnight to her. And why wouldn’t she? Image credit: Maire Fogarty. Do not reproduce this image without permission.